Audi will introduce four all-wheel-drive S models at the Frankfurt auto show in mid-September, all running the company's latest twin-turbocharged 4.0-liter V-8 direct-injection engine developed in partnership with Bentley. 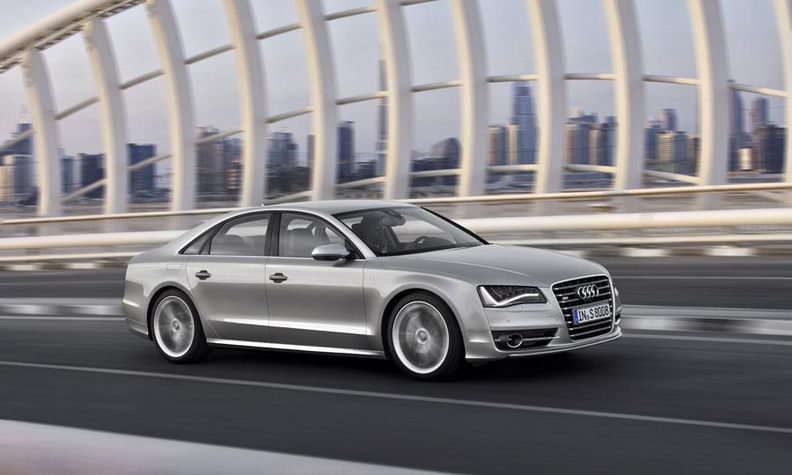 The quartet of new S models include successors to the S8, S7 and S6 sedans and the S6 Avant. The plush S8 swaps the naturally aspirated 5.2-liter V-10 of its predecessor for the most powerful version of Audi's twin-turbocharged 4.0-liter V-8 engine. Peak power is up to 512 hp, with torque increased to 479 pounds-feet. The increased reserves are channeled to all four wheels through a specially adapted eight-speed Tiptronic automatic gearbox that supports automatic stop/start and brake-energy recuperation. The sedan has a claimed 0-to-100kph time of just 4.2 seconds and a top speed, like that of all of Audi's new S models, limited to 250kph. In spite of the wholesale increase in performance, Audi claims the S8 is more fuel efficient, in part because of a new cylinder-on-demand function that deactivates four of the engine's eight cylinders on partial throttle loads. An active-noise-cancellation system used to suppress engine and wind noise for a quieter, smoother ride in four-cylinder mode is among the other technological highlights that will appear on the S8. The cancellation setup consists of four microphones integrated into the headliner that constantly record the noise within the cabin. The result is then analyzed for what Audi describes as "intrusive elements," and when required, an antiphase sound is played through the speakers to cancel it out. Audi's new S6 sedan and the S7 will each run a less powerful version of the V-8 powertrain making 414 hp and 406 pounds-feet. These S models also adopt Audi's seven-speed dual-clutch S-tronic gearbox in place of the older six-speed automatic used by their predecessors. Other new developments include a reworked all-wheel-drive system. As with the S8, the S6 sedan and the S7 also receive Audi's new cylinder-on-demand system and active noise cancellation as standard.